Italian Christmas Cake that you have dreaming for. 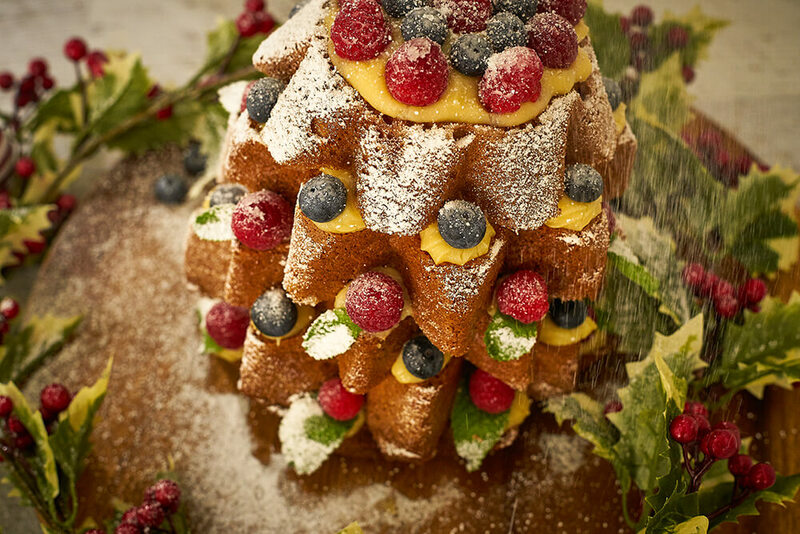 Ever tried to make a Christmas tree for dessert during the festive season? 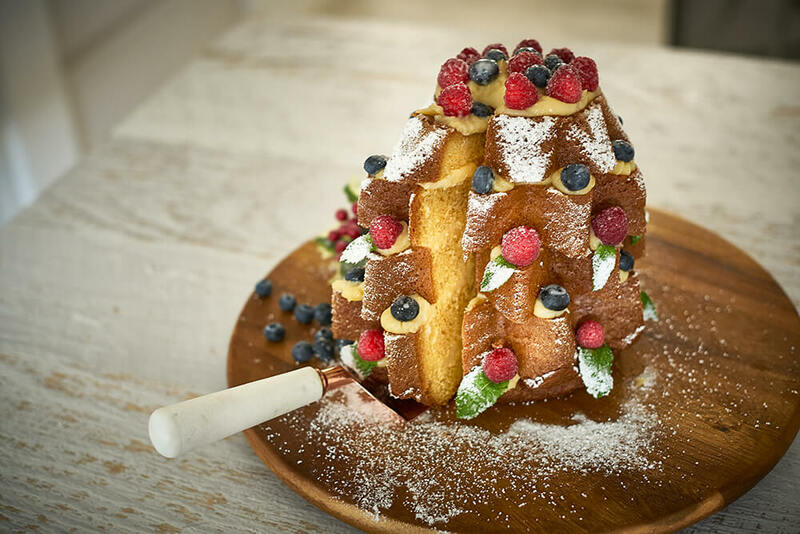 This is the no fuss, no bake Italian Christmas Cake recipe filled with creamy Italian custard and topped with fresh fruit that will WOW your guests and make the perfect centrepiece on your dessert table. 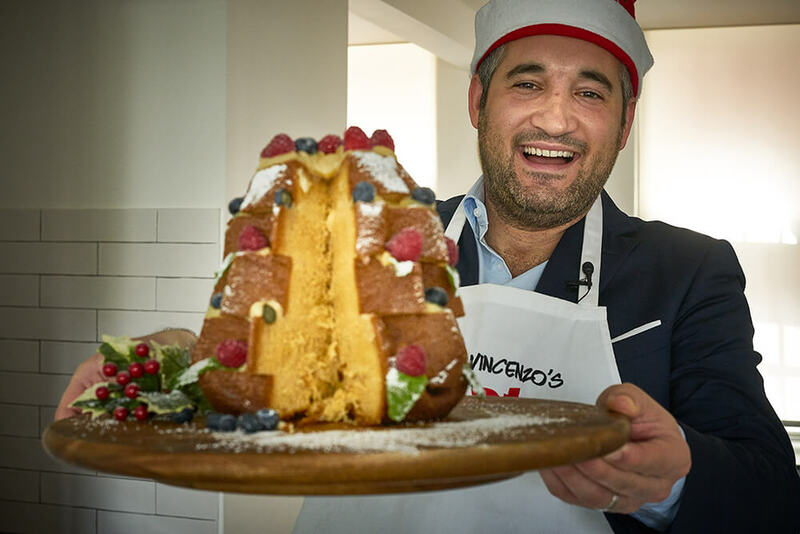 “The key ingredient for this Christmas Cake is Pandoro, a moist, star-shaped cake traditionally enjoyed by Italians at Christmas time. 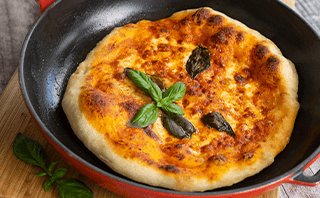 The name is derived from the Italian words “Pan d’oro” which mean golden bread! It took a century to perfect the Veronese recipe from when it was first developed and the number one brand in Italy is Bauli. 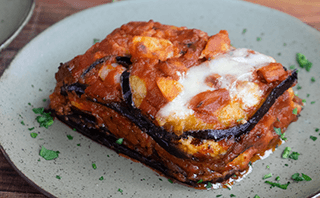 Thanks to Basile imports, I have created a mouth-watering recipe using Bauli Pandoro for you and your family to enjoy – and it’s also a pretty instagrammable one too!” Vincenzo’s Plate. Add 400g sugar to a mixing bowl and sift in 100g plain flour. 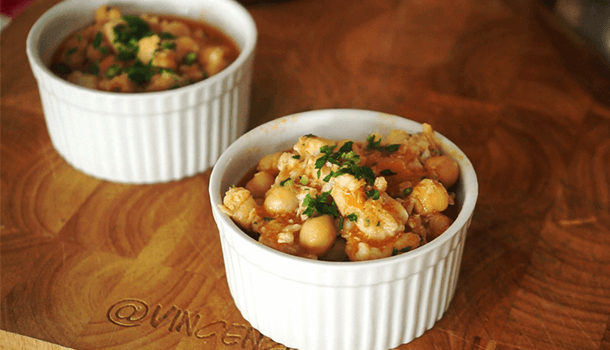 Transfer this into a medium size saucepan and put it on a stove at a low-medium temperature. Add 1L of fresh milk and 8 egg yolks and stir to combine using a whisk. Drop in a few strips of lemon rind, a cinnamon stick and a vanilla bean. 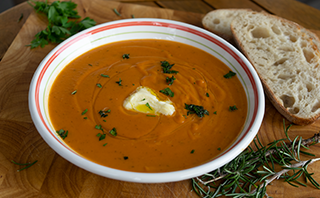 Stir gently and continuously while on heat for 5-10 minutes or until you see it start to thicken and form. Remove from heat. Get a large mixing bowl and pour the custard into the bowl through a sieve so that you can get rid of any lumps and also to make sure the cinnamon, lemon and vanilla don’t drop inside. Add a layer of glad wrap on top of the custard so that it is touching it and stick the edges to the sides of the bowl. Then, press down gently on the custard using your finger to prevent any air bubbles from forming. Keep this in the fridge for a couple of hours to cool. 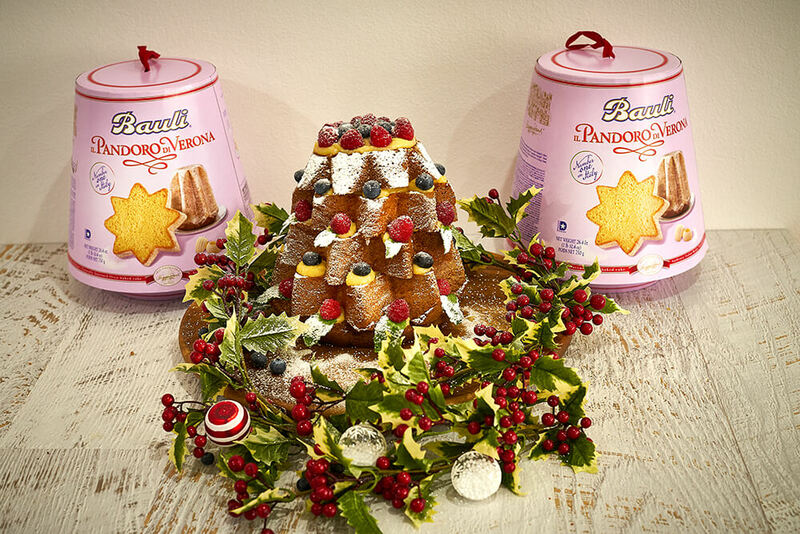 Remove the Pandoro from the packaging and put the icing sugar to the side. 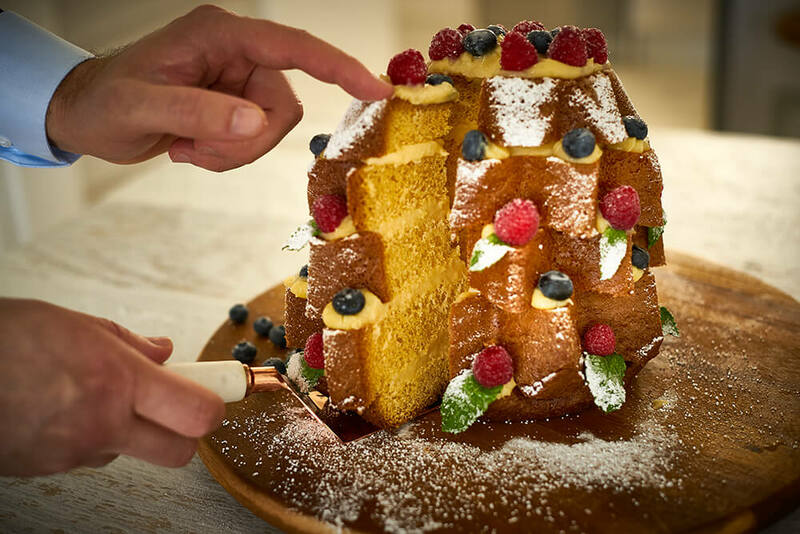 Place the Pandoro on its side and using a sharp, long knife, cut it into 5 slices. Make sure the bottom slice is slightly thicker than the others. Place the bottom layer on a chopping/serving board and spread a thick layer of custard on top, in the centre, using a spatula. Then, place the next slice of Pandoro on top, making sure it is off centre so that you start forming the shape of a Christmas tree. Lather custard on top of this layer and place the next slice on top. Repeat this until you top off the Christmas cake with the final slice. Put a few generous spoonful’s of custard into the piping bag and squeeze small amounts onto each star peak of your Christmas tree. Starting with the bottom layer, place small mint leaves on top of the custard swirls and add a raspberry to each one (it will look just like holly!). On the layer above place blueberries on top of the swirls and then repeat steps 15 & 16 until you reach the top! Add more custard to the top of your Italian Christmas cake and then decorate the way you like with fruit on top. Finally using a sieve, sift the Bauli icing sugar on top of the dessert so it looks like s touch of snow! This Italian Christmas cake looks wonderful dressed with small festive decorations and can be served right away. 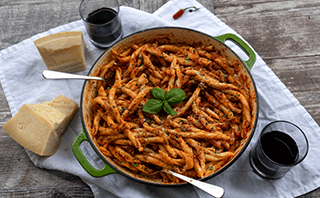 VINCENZO’S PLATE TIP: If you wish to make this the day before, you will need to remove it from the fridge at least an hour before serving, but be warned, it can dry up a little if you choose this option! Slice a large piece of the Pandoro Christmas cake with a long, sharp knife, starting from top to bottom and place the slice on a plate on its side. Then, cut this slice onto 1-2 pieces, by cutting the cake part so you don’t remove any of the custard. Add a few extra dollops of custard to the plate – it’s CHRISTMAS after all! 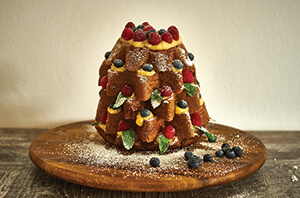 Have you got your Christmas Menu Sorted? Join my Culinary Tour “Italy Unexplored Tour” and experience the Real Italy like you have never seen before. The tour is exclusive to only 10 passionate foodies and it’s very unique. Visit this Italian Tour link for more details.